Personally, I don’t see the big deal in Marlo being friends with Kenya. Nene doesn’t own rights to Marlo so why put up a fight with Kenya and stop talking to Marlo all because they decide to be friends? Then the whole debacle with Kandi over calling Kandi’s mom names? Le’Sigh. I’m over Nene, totally over her. Now on to the husbands – Now, am I the only one who thinks Kenya should let this issue with Apollo be. I’m saying, be friends with Phaedra and act like Apollo does not exist because every reunion show, he tries to make her look a fool but during the season he is busy flirting with her. Errrr, If I were Kenya, I would totally blank him like, go exist somewhere else. I have watched over and over to try and see why Peter is being criticized so darn much. I don’t see how he is wrong for having an opinion – we all do. He speaks his mind without insulting anyone so what exactly is the problem? lll still pick Peter over Gregg the human handbag anytime. 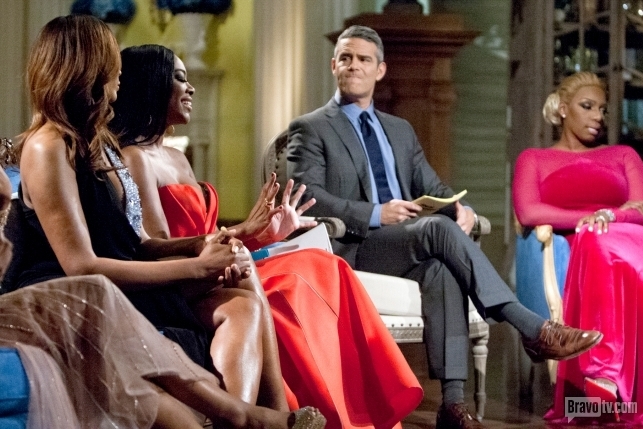 All in all, the Reunion Show’s Part 3 was as usual, full of drama. Who is coming back next season? Time will tell. Who should go? Ill keep it as simple as, all the ladies should stay and Nene should bow out. You can watch bits of the show below. Apollo Nida talks about the charges against him and why Kenya Moore should be paying him. Oh! Starting June 1st, the show documenting Kandi’s Wedding is starting. Yup ill be bringing you more talk from what went down right here on ETP.